Despite the explosive growth of smartphones and growing popularity of mobile web browsing, the energy consumed by a phone browser while surfing the web is poorly understood. While web pages are often optimized for speed and beauty, little attention is given to the amount of energy needed to download and render the page. Dr. Angela Nicoara is a Senior Research Scientist at Deutsche Telekom Innovation Laboratories, Silicon Valley Innovation Center, USA since 2008. She received a PhD in Computer Science from ETH Zurich in 2007, where she was the leader, designer and builder of the PROSE open source system. After two years building search engine and information logistics systems at the German software company Caatoosee, Dr. Nicoara joined ETH Zurich, working on adaptive software architectures. Dr. Nicoara joined Google Inc in Mountain View, California for the summer of 2004. Her research interests are in the areas of services and mobile platforms, adaptive software architectures, virtual machines, middleware for mobile and distributed computing, and distributed systems. Her current research activities include the development of open and programmable mobile platforms (e.g., Android) and novel information technology services to shape the emerging trends in fixed and mobile infrastructure and services sectors. Dr. Nicoara's work has been published in numerous leading scientific conferences, workshops and symposia proceedings, and is a regular speaker and panelist at major international scientific and industry conferences. 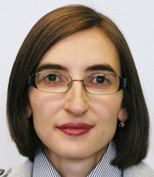 Dr. Nicoara received several prestigious awards and honors for her research and technical contributions, the most recent ones include the Best Paper Award from IEEE RTAS 2012 and Best Student Paper Award from ACM WWW 2012 . Her work has been quoted by the press and media, as well as she chaired and served as a technical program committee (TPC) member of multiple industry and academic conferences. Dr. Nicoara is a member of ACM and IEEE societies.